Our future success depends on our ability to create a flexible, global workforce that is responsive and highly resilient in responding to the needs of our business. Swiss Re is following an integrated, future-focused strategy that brings together our physical workplace, technology and people management practices to take us to the next level. 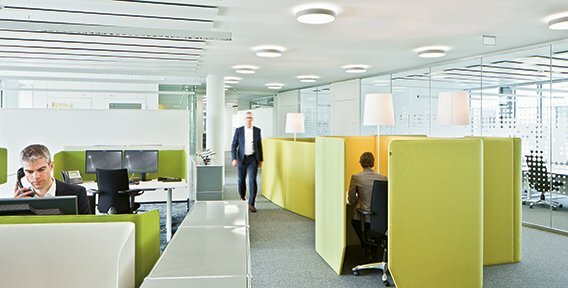 New functional zones for concentration and communication in our Munich office support our employees’ individual working modes and styles. We have made considerable efforts in ensuring our employees own the way they work and can effectively collaborate in an agile and flexible working environment. This is reflected in a variety of formal and informal flexible working arrangements that focus on performance outcomes versus face time. Our trademarked programme, Own the Way You WorkTM, is a cultural change initiative, which gives managers and employees autonomy to decide how, when and where work is carried out, in compliance with the applicable laws, rules and regulations of their particular region. This has become a differentiating part of Swiss Re’s employee value proposition.